Ocular burns consist of burns to the sclera, conjunctiva, cornea, and eyelids. Chemical burns, particularly those involving the cornea, are considered a true ophthalmologic emergency and require prompt assessment and intervention to minimize morbidity. Ocular burn injuries are classified by etiologic agents as either chemical injuries (eg, those caused by acid or alkali) or radiant energy injuries (eg, those caused by heat, electricity or ultraviolet [UV] radiation). See the image below. Severe chemical injury with early corneal neovascularization. Many ocular burns can be adequately managed in the emergency department (ED). Transfer may be required for specialized ophthalmologic care; however, the emergency physician must evaluate the patient’s stability for transfer. In some situations, life-threatening conditions (eg, airway burns) must be addressed (securing of the airway) prior to transfer. For patients with thermal burns, transfer to a burn center is indicated in the presence of significant facial involvement or inhalation injury. The severity of an ocular burn is directly correlated with the duration of exposure and the causative agent. In particular, chemical burn severity relates to the solution pH, contact duration, solution quantity, and solution penetrability. Injury from radiant energy usually results from contact with hot liquids, hot gases, fireworks or molten metals. Cell death from thermal burns is limited to the superficial epithelium; however, thermal necrosis and penetration can occur. Alkali substances are lipophilic and penetrate more rapidly than acids. Saponification of cell membrane fatty acids causes cell disruption and death. In addition, the hydroxyl ion hydrolyzes intracellular glycosaminoglycans and denatures collagen. The damaged tissues stimulate an inflammatory response, which damages the tissue further by the release of proteolytic enzymes. This is termed liquefactive necrosis. Alkali substances can pass into the anterior chamber rapidly due to the inability to buffer alkali (within approximately 5-15 min), exposing the iris, ciliary body, lens, and trabecular network to further damage. Irreversible damage occurs at a pH value above 11.5. Acid burns cause protein coagulation in the corneal epithelium, which limits further penetration. As a rule, these burns are nonprogressive and superficial. Hydrofluoric acid, however, is an exception to this rule: it is a weak acid that rapidly crosses the cell membrane as it remains nonionized. In this way, hydrofluoric acid acts like an alkali, causing liquefactive necrosis. In addition, fluoride ions are released into the cells. Fluoride ions may inhibit glycolytic enzymes and may combine with calcium and magnesium to form insoluble complexes. The extreme local pain is believed to result from calcium immobilization, which leads to nerve stimulation by shifting potassium ions. Acute fluorinosis can occur as the fluoride ions enter the systemic circulation, resulting in cardiac, respiratory, gastrointestinal, and neurologic symptoms. Severe hypocalcemia, which is resistant to large doses of calcium, can occur. Thermal injuries can be caused by hot substances (eg, curling irons, hot curlers, cigarettes, and hot liquids). Hot liquids have been known to splash into the eye from substances that explode after removal from a microwave; steam from hot liquids is also a potential cause. Fire is a common cause of burns to the face and eyes. Multiple chemicals used in the home and work environment can lead to injury. Common acids causing ocular burns include sulfuric acid, sulfurous acid, hydrochloric acid, nitric acid, acetic acid, chromic acid, and hydrofluoric acid. Automobile battery explosion, which causes a sulfuric acid burn, is perhaps the most common acidic burn of the eye. Hydrofluoric acid may be found at home in rust removers, aluminum brighteners, and heavy-duty cleaners. Certain industries use hydrofluoric acid in brick cleaning, glass etching, electropolishing, and leather tanning. Hydrofluoric acid also is used to control fermentation in breweries. Ocular hydrofluoric toxicity can occur from liquid or gaseous exposure. Common alkali substances contain ammonium hydroxide, potassium hydroxide, sodium hydroxide, calcium hydroxide, and magnesium hydroxide. Substances that contain such compounds and can be found in a home include lye, cement, lime, and ammonia. Laundry detergent pods are also becoming a new source of exposure in the pediatric population. Air bags aerosolize sodium hydroxide on inflation and may cause an alkali keratitis. Additionally, sparklers and flares contain magnesium hydroxide and phosphorus. Ocular burns represent 7-18% of the eye injuries seen in EDs. Eye injuries account for 3-4% of all occupational injuries. The vast majority (84%) are chemical burns. Thermal burns account for 16% of ocular burn cases. Approximately 15-20% of patients with facial burns exhibit ocular injury. The ratio of the relative frequencies of acids and alkalis as the causative agents of chemical injury ranges from 1:1 to 1:4, according to several studies. Any age group may be at risk for ocular burns. One study indicated that the average age of patients with ocular burns was 36 years. There is a strong association of ocular burns with younger age groups within the occupational setting. Ocular burns are more common in males than in females. This difference probably reflects the male predominance in the industrial occupations at highest risk for ocular injury, such as construction and mining. 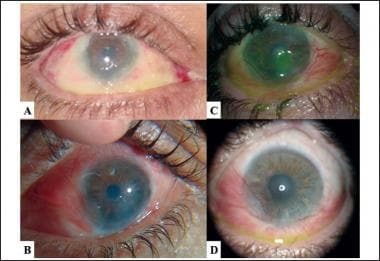 Photographs of right eye after airbag-related alkali burn at 1 week (a), 2 months (b), 4 months (c), and 6 months (d) after the initial motor vehicle accident with airbag deployment. Note severe limbal ischemia at 1 week (a) leading to severe conjunctivalization of the cornea at later time points. Courtesy of Shawn S Barnes, MSIV, University of Hawaii, John A Burns School of Medicine. The major concerns with ocular burns are final visual acuity (ie, degree of visual impairment) and cosmetic appearance (eg, extent of scarring). Thermal burns can cause significant corneal and ocular adnexal injuries. Stern et al, reviewing 127 patients who sustained ocular injury secondary to thermal burns, found that eyelid burns were the most common complication, occurring in 52 patients.  . Of those 52 burn victims, approximately 60% developed eyelid contractures. Stromal haze with opacification of the cornea. Complete cicatrization of the corneal surface. Chemical burns are often bilateral and frequently result in devastating vision loss. Ocular complications of severe burns include glaucoma, corneal perforation, cataracts, scarring of the cornea, conjunctival cul-de-sac, conjunctiva and eyelid complications, retinal detachment, and corneal ulcerations. As much as to 1-2 years of corrective surgery may be needed to correct damage from more severe burns. A study by Kuckelkorn et al reported that one third of 131 patients with ocular burns were considered disabled; approximately 15% were considered blind. In 1995, almost one third of corneal transplants were for eyes that sustained chemical injury. Unfortunately, the success rate for transplants for this condition is less than 50%. Some patients require 4-5 transplants before success is achieved. An estimated 90% of chemical eye injuries are avoidable. It is essential to emphasize the importance of wearing safety glasses when working with hazardous materials or in hazardous situations. Children sustain chemical burns most often when they are unsupervised. It is therefore critical to keep all hazardous home products in an area that is difficult for a child to access. For patient education resources, see the Burns Center, as well as Eye Injuries, Chemical Eye Burns, Thermal (Heat or Fire) Burns, and How to Instill Your Eyedrops. Tuft SJ, Shortt AJ. Surgical rehabilitation following severe ocular burns. Eye (Lond). 2009 Oct. 23(10):1966-71. [Medline]. Barkana Y, Belkin M. Laser eye injuries. Surv Ophthalmol. 2000 May-Jun. 44(6):459-78. [Medline]. Bae EJ, Hong IH, Park SP, Kim HK, Lee KW, Han JR. Overview of ocular complications in patients with electrical burns: An analysis of 102 cases across a 7-year period. Burns. 2013 May 17. [Medline]. Corazza M, Trincone S, Virgili A. Effects of airbag deployment: lesions, epidemiology, and management. Am J Clin Dermatol. 2004. 5(5):295-300. [Medline]. Javadi MA, Yazdani S, Sajjadi H, et al. Chronic and delayed-onset mustard gas keratitis: report of 48 patients and review of literature. Ophthalmology. 2005 Apr. 112(4):617-25. [Medline]. Merle H, Gerard M, Schrage N. [Ocular burns]. J Fr Ophtalmol. 2008 Sep. 31(7):723-34. [Medline]. Xiang H, Stallones L, Chen G, Smith GA. Work-related eye injuries treated in hospital emergency departments in the US. Am J Ind Med. 2005 Jul. 48(1):57-62. [Medline]. Christoffersen T, Olsen EG. Injury to the cornea due to fish bile. Scand J Work Environ Health. 1993 Oct. 19(5):358-9. [Medline]. Avon Global Center for Women and Justice at Cornell Law School and the New York City Bar Association, 2011. Combating Acid Violence in Bangladesh, India, and Cambodia. Available at http://www.acidviolence.org/uploads/files/Virtue_Foundation_Combating-Acid-Violence-Report-2011.pdf. Accessed: June 8, 2013. Barnes SS, Wong W Jr, Affeldt JC. 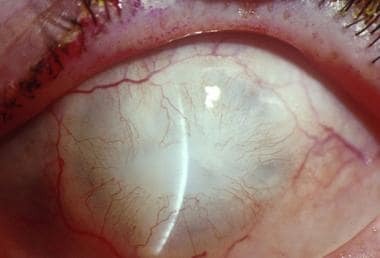 A case of severe airbag related ocular alkali injury. Hawaii J Med Public Health. 2012 Aug. 71(8):229-31. [Medline]. [Full Text]. Dua HS, King AJ, Joseph A. A new classification of ocular surface burns. Br J Ophthalmol. 2001 Nov. 85(11):1379-83. [Medline]. [Full Text]. Gupta N, Kalaivani M, Tandon R. Comparison of prognostic value of Roper Hall and Dua classification systems in acute ocular burns. Br J Ophthalmol. 2011 Feb. 95(2):194-8. [Medline]. Bhalekar S, Basu S, Lal I, Sangwan VS. Successful autologous simple limbal epithelial transplantation (SLET) in previously failed paediatric limbal transplantation for ocular surface burns. BMJ Case Rep. 2013 May 10. 2013:[Medline]. Stern JD, Goldfarb IW, Slater H. Ophthalmological complications as a manifestation of burn injury. Burns. 1996 Mar. 22(2):135-6. [Medline]. Kuckelkorn R, Schrage N, Keller G, Redbrake C. Emergency treatment of chemical and thermal eye burns. Acta Ophthalmol Scand. 2002 Feb. 80(1):4-10. [Medline]. Peate WF. Work-related eye injuries and illnesses. Am Fam Physician. 2007 Apr 1. 75(7):1017-22. [Medline]. Occupational Safety and Health Standards. OSHA. June 18, 1998. Available at http://www.osha.gov/pls/oshaweb/owadisp.show_document?p_id=9806&p_table=STANDARDS. Das S, Chohan A, Snibson GR, Taylor HR. Capsicum spray injury of the eye. Int Ophthalmol. 2005 Aug-Oct. 26(4-5):171-3. [Medline]. Ikeda N, Hayasaka S, Hayasaka Y, Watanabe K. Alkali burns of the eye: effect of immediate copious irrigation with tap water on their severity. Ophthalmologica. 2006. 220(4):225-8. [Medline]. Malhotra R, Sheikh I, Dheansa B. The management of eyelid burns. Surv Ophthalmol. 2009 May-Jun. 54(3):356-71. [Medline]. Sharifipour F, Baradaran-Rafii A, Idani E, Zamani M, Jabbarpoor Bonyadi MH. Oxygen therapy for acute ocular chemical or thermal burns: a pilot study. Am J Ophthalmol. 2011 May. 151(5):823-8. [Medline]. Prabhasawat P, Tesavibul N, Prakairungthong N, Booranapong W. Efficacy of amniotic membrane patching for acute chemical and thermal ocular burns. J Med Assoc Thai. 2007 Feb. 90(2):319-26. [Medline]. Tejwani S, Kolari RS, Sangwan VS, Rao GN. Role of amniotic membrane graft for ocular chemical and thermal injuries. Cornea. 2007 Jan. 26(1):21-6. [Medline]. Liang L, Li W, Ling S, Sheha H, Qiu W, Li C, et al. Amniotic membrane extraction solution for ocular chemical burns. Clin Experiment Ophthalmol. 2009 Dec. 37(9):855-63. [Medline]. Schrader S, Notara M, Beaconsfield M, Tuft SJ, Daniels JT, Geerling G. Tissue engineering for conjunctival reconstruction: established methods and future outlooks. Curr Eye Res. Nov 2009. 34(11):913-24. [Medline]. Burcu A, Yalniz-Akkaya Z, Ozdemir MF, Erdem E, Onat MM, Ornek F. Surgical rehabilitation following ocular chemical injury. Cutan Ocul Toxicol. 2013 May 28. [Medline]. Marquez De Aracena Del Cid R, Montero De Espinosa Escoriaza I. Subconjunctival application of regenerative factor-rich plasma for the treatment of ocular alkali burns. Eur J Ophthalmol. 2009 Nov-Dec. 19(6):909-15. [Medline]. Haring RS, Sheffield ID, Channa R, Canner JK, Schneider EB. Epidemiologic Trends of Chemical Ocular Burns in the United States. JAMA Ophthalmol. 2016 Oct 1. 134 (10):1119-1124. [Medline]. Lewis CJ, Al-Mousawi A, Jha A, Allison KP. Is it time for a change in the approach to chemical burns? The role of Diphoterine® in the management of cutaneous and ocular chemical injuries. J Plast Reconstr Aesthet Surg. 2017 May. 70 (5):563-567. [Medline].